During San Diego Comic-Con, fans of the newly named Worlds of DC were thrilled to see the new trailer for AQUAMAN, starring Jason Momoa. Fans have held high hopes of this film saving the divisive DC Cinematic Universe. And as far as the trailer goes, it has gotten the hype chain rolling. However, what I noticed first and foremost were the obvious ties to the New 52 AQUAMAN stories. These comparisons are largely unsurprising, as Director James Wan has stated that New 52 AQUAMAN acted as his primary source of inspiration for the film. 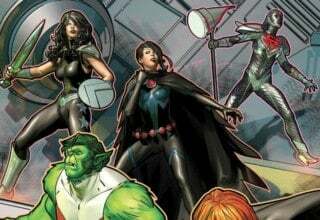 With only months to go before the film releases to the general public, we here at ComicsVerse have decided to go through the trailer and the brief history of the New 52 stories. 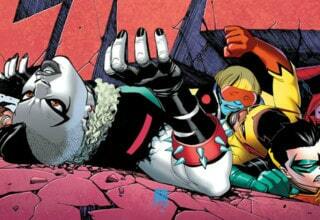 Through this, we will examine how the New 52 might impact the upcoming film. 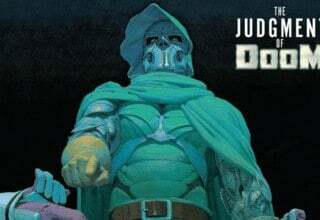 As such, expect spoilers for the comics, and once you are done reading this article, do go read that fantastic series. During the New 52 AQUAMAN, Geoff Johns and all subsequent writers of the series took it upon themselves to reinvent the character. And reinvent they did. 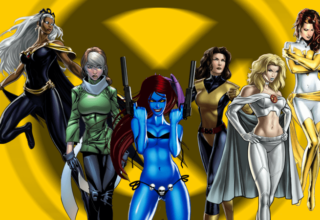 They took all of the best elements of previous incarnations and mashed them all into one. From the Silver Age, they took the persona of the wise king and melded it with the hardened warrior of the ’90s. The result was a character who could handle any situation without batting an eyelash. His first appearance in JUSTICE LEAGUE Vol. 1 cemented this new persona, displaying him as a warrior to be feared in and out of the water. Even without the fish at his side, he held his own alongside the League as they battled the brutal Darkseid and won. He even managed to take the New God’s eye. 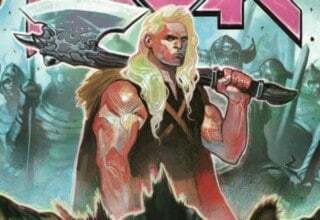 Moreover, the New 52 AQUAMAN series defined Arthur Curry as more than just this warrior king. It also strove to add depth to his story. Johns made this hero a relevant character in today’s modern world. He poked fun at the character’s history and unabashedly made self-referential jokes about the character. 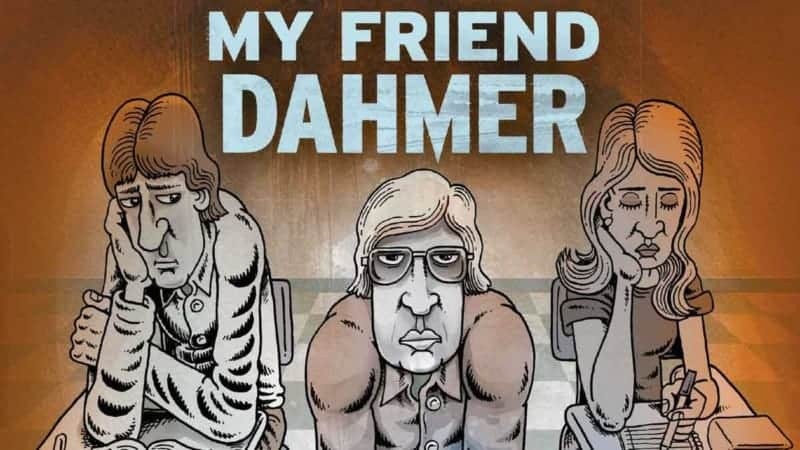 Meanwhile, he fleshed out Arthur’s history and turned it into a narrative of revenge and anger. This Arthur never wanted to become King of Atlantis. He wanted a simple life with his father before it all got stripped away from him. Even after becoming king, he made a royal mess of it. Johns developed an arc in which Arthur Curry needed to grow up and take responsibility for his past. It doesn’t get any better than that. Arthur Curry was born to a human lighthouse keeper and an Atlantean Queen. In New 52 AQUAMAN, we learn that during a severe storm, Tom Curry was caught on the water in his boat. He would surely have died if not for the intervention of a beautiful woman who came up out of the sea. This woman, Queen Atlanna, saved Tom Curry’s life, and the pair fell in love. Arthur became the result of that love. Before Queen Atlanna even knew she was pregnant, though, she had returned to Atlantis. There, due to her consorting with a surface dweller, her people imprisoned her. Just before Arthur’s birth, she escaped and fled to the surface, where Arthur was finally born. Almost immediately after, Atlanna returned to Atlantis. Believing that her people would hunt Arthur, a half-breed “abomination,” she would turn herself in to mitigate their anger. No time passed at all before the Atlanteans forced her into a marriage. Her suitor, the captain of the Atlantean guard, impregnated her with her second son, Orm. During a revolt, Orm’s father died. Seeing her chance, Atlanna tried to take Orm with her to the surface world to find his brother. She would never leave Atlantis, and while no one knows the truth of her death, the New 52 AQUAMAN stories seem to suggest that Orm may have killed her. He then assumed his father’s throne and ruled over Atlantis. Arthur Curry never knew his mother, but he loved and adored his father. Together, they worked the lighthouse and lived a happy life. That is until Arthur first started exhibiting superpowers. 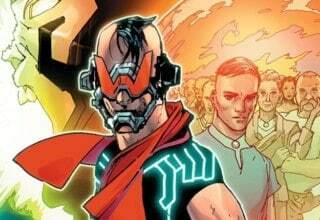 In the New 52 AQUAMAN, Tom Curry brought his son to one Dr. Stephen Shin, a known marine biologist. Shin worked tirelessly to understand the boys’ powers and study them. He even learned all he could of Atlantis and the boy’s mother. Shin, however, had ulterior motives. While developing a close bond with the child, he also sought to use the boy for his own fame. Arthur would make Shin famous for two reasons. One, the biological community would respect him for “discovering” the first reported Atlantean. And two? Arthur was going to take Shin to Atlantis. When Tom refused to give Shin any more time, Shin took to drastic measures. He hired a notorious treasure hunter name Black Manta to get a vial of Arthur’s blood. When Tom fought back against the assailant, he had a heart attack. This would eventually kill Tom Curry and make Arthur an orphan. Lost in the world, furious over his losses, Arthur ran away and hid beneath the ocean’s surface. After the loss of his father, Arthur scoured the seas for his killer. Through many restless nights and plenty of research, Arthur found Black Manta’s boat. Boarding, Arthur saw a dim shape in the storm and struck out at it. It was not Black Manta, though. Rather, it was the Manta’s father, the captain of the treasure hunting vessel. When Black Manta rose from the ocean to find his father dead, he locked himself and the New 52 Aquaman in an endless cycle of vengeance. Angry and lost, Arthur sought for any sense of community. While out during a storm, he stopped a boat from colliding with the rocky coastline. The boat’s captain told the young man about a Norwegian fisherman named Vulko. This fisher claimed to be an Atlantean Royal Advisor. Immediately, Arthur searched for this man, and Vulko recognized his king. Together, they swam to Atlantis. Orm, a believer in Atlantean royal customs, abdicated the throne to his older brother. His people, though, did not agree with this decision. They called for Arthur’s own abdication. In order to ease tensions, Arthur did many things that his people wanted. He created Atlantean war plans against the surface world. He even sought ancient Atlantean relics (more on this later). It wasn’t until Darkseid’s invasion that Arthur fully returned to the surface world. Aiding the burgeoning Justice League showed the New 52 Aquaman the good of the dry world. He could do some real good besides these heroes. Seeing this, he turned his attention away from Atlantis. He gave the throne back to his brother, and he returned to his father’s lighthouse on the beach. Together with his love, Mera, he became a hero and most importantly a human being. Aquaman’s Origins: Do They Fit the Film? Now, this is a lot of information about the New 52 Aquaman’s origins. This story is spread out across the first sixteen issues of the AQUAMAN series. Nevertheless, from what we know about the film and from the SDCC trailer, all of it could very well be important. Let’s start with his parents. While we do not know the specifics, we do know from Jason Momoa’s voiceover at the trailer’s start that the story largely holds true. His father, a lighthouse keeper, and the Queen of Atlantis met and fell in love, resulting in Arthur. We even get a glimpse of his parents (Nicole Kidman and Temeura Morrison) at the famed lighthouse, holding a young Arthur. Also, from what we can gather from the JUSTICE LEAGUE, his mother may still be alive. According to that Aquaman, she seemingly abandoned him. We also see a shot of a young Arthur in a local aquarium. This is the first instant in the trailer where we see his powers, as he calls a shark to aid him. While this doesn’t say anything about the possible existence of Dr. Stephen Shin, it does point to their possible relationship here. After all, Warner Bros. has cast Randall Park in that role. It would make sense for this scene to signal the relationship seen in New 52 AQUAMAN. Again, we don’t see Park in the trailer, but this seems like an obvious and powerful character development moment that Warner Bros. would be foolish not to utilize. Black Manta & King Orm: The Villainous Duo? As stated, Orm in the comics is deeply beholden to Atlantean law. He would give up his place to Arthur if that were still true. Here, though, it seems that Orm has become Ocean Master far earlier than in the comics. His villainous side has fully come out, as we will see in his motivations. Black Manta (Yahya Abdul-Mateen II) in the trailer is incredibly interesting. Other sources have stated that while AQUAMAN will have three villains (Black Manta, Ocean Master, and the Trench), only Ocean Master will act as the primary baddy. Outside of this, we know absolutely nothing else about Black Manta’s role in the film. I would wager, though, that the New 52 origins will likely hold true. I take this from one other minor casting, that of Black Manta’s father, Jesse Kane (Michael Beach). Considering that this character’s only role in the New 52 AQUAMAN was to die, I’d bet that this will come to pass again in AQUAMAN. 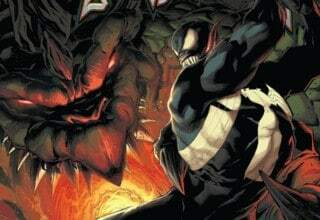 While we have explored both of these villains’ origins in the comics and possibly in the film, this says nothing of their motivations. Two other AQUAMAN storylines may shed some light onto their villainous plans. DC’s Superman: Does He Still Belong Here? The “Throne of Atlantis” story arc is notable as one of the first major crossovers of the New 52. It is also one of the few crossovers featuring the New 52 AQUAMAN. 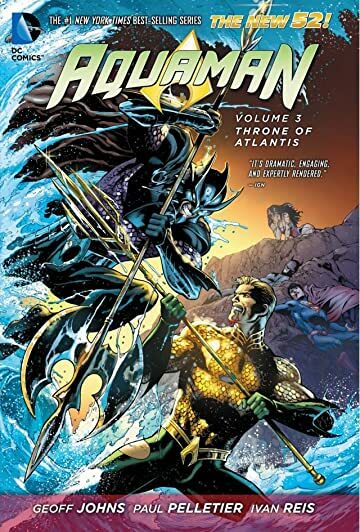 Set with AQUAMAN #14-16 and JUSTICE LEAGUE #15-17, this story focuses on a slighted Atlantis enacting the Atlantean war plans. King Orm, using the Ocean Master helmet, causes massive tidal waves to strike three major American cities. Metropolis, Gotham, and Boston sink beneath the waters. While trying to save as many lives as possible, Arthur and the Justice League are confronted by Orm’s forces and nearly defeated. Cyborg even has to call in reinforcement Justice Leaguers to stem the tide of battle. Meanwhile, a secret villain plans from the shadows and seeks to use the Trench against the surface world. The “Throne of Atlantis” is notable for a number of reasons. On a grander scale, this story set in motion a number of other key crossover events like “Trinity War” and “Forever Evil.” It is also the impetus for the Justice League to increase their ranks. Moreover, for the New 52 AQUAMAN, there could not be a more important story. 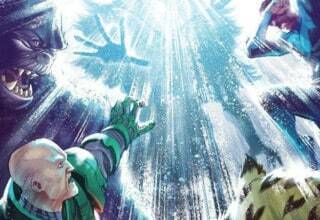 “Throne of Atlantis” proved to readers that DC Comics was finally taking Aquaman seriously. 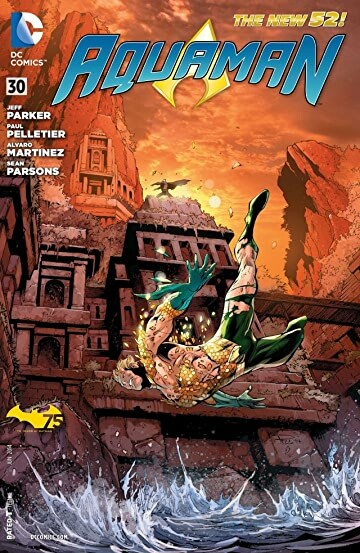 This was the first Aquaman story that I ever read, and the combination of GAME OF THRONES level intrigue with incredible superhero action sequences had me astounded from the start. From what we see in the trailers, “Throne of Atlantis” is the most obvious influence on the events of WB’s AQUAMAN. The first thing that Mera tells Arthur in the trailer is that Orm plans on attacking the surface world. Using the full strength of Atlantis’ armies, he looks to dominate. In the comics, the inciting event for this attack comes from an accident. A US military sub launches a series of missiles that go off course and strike Atlantis. This makes the New 52 AQUAMAN Orm less of a villain and more of a righteous guardian. In the trailer, though, I did not get this sense. From everything we’ve learned, Orm’s attack seems unprovoked. In fact, this coming battle seems serious enough to bring Arthur back beneath the water. Click here to Read AQUAMAN: THRONE OF ATLANTIS on Comixology to discover the film’s inspiration! “Throne of Atlantis” provides AQUAMAN with an interesting opportunity. Obviously, in the comics, this is also a JUSTICE LEAGUE story. It is highly unlikely that other Justice League heroes will make an appearance. Still, Warner Bros. could use this opportunity to ground this film in the greater context of their shared universe. They can show the scale of the threat by displaying an attack on Gotham and Metropolis. We might never see Superman or Batman, but this would go to great lengths to give this world a concrete context. We could see this as one thriving ecosystem (the shared universe), not just several small biomes (the individual films). Next to the “Throne of Atlantis” story arc, “The Others” is my favorite New 52 AQUAMAN story. In this story, Mera pays witness to Arthur’s secret past. After the murder of Black Manta’s father, the two were at constant war with each other. This grew so savage and so world-spanning that Aquaman eventually recruited a team of his own. Together, they sought for ancient and incredibly powerful Atlantean relics hidden by the city’s first king. Using these relics, the team hunted down Black Manta time and again, only to have the villain slip through their fingers. Back in the present day, Black Manta has discovered a seventh relic of the Dead King, an earth moving scepter, and seeks to have it for his own. Will “The Others” show up in the AQUAMAN movie? Probably not. I even think Black Manta won’t appear for long. From everything that’s come out about this film, though, AQUAMAN will be a treasure hunting film in part. Arthur and Mera are seen in the trailer amidst sandy ruins, and my only guess is that they are hunting some major Atlantean relic. Wan has noted that this relic will be the Trident of Atlan, Atlantis’ first king. The comparison from here is rather obvious. This then makes Black Manta’s role rather obvious as well. He will be seeking the trident, putting him in direct conflict with Arthur. Whether Manta wants the Trident for himself or Orm hired him, we don’t know. Nevertheless, their fight in the trailer makes all the more sense. “The Trench” stands as the New 52 AQUAMAN’s first adventure. In fact, it is the story that actively reinvented the character. Geoff Johns pits Arthur and Mera against the ocean’s greatest threat: a horde of nightmarish deep sea humanoids called the Trench. Incredibly hard to kill and highly deadly, this foe nearly bests Mera and Arthur during their first encounter. Arthur is forced to destroy an undersea volcano to bury the Trench beneath the sea. This proves futile, though, as a mysterious figure breaks them free and sets them on Orm and Arthur during the “Throne of Atlantis” story arc. In regard to the final “villain” of the AQUAMAN film, that role likely belongs to “The Trench” and whoever controls them. We learn in the “Throne of Atlantis” storyline that the Dead King’s scepter controls the Trench. If King Atlan’s trident acts as a stand-in for the scepter, the final moments of the trailer make absolute sense. Mera and Arthur, wielding a flare, leap from a monster-infested boat into a monster-infested ocean. These creatures are the Trench in all of their horrifying glory. We do not know who, in the film, is controlling these monsters, if anybody. I would assume that whoever finally gains the Trident will control the horde. However, things can change from page to screen. I’m just excited to see these monstrous enemies in the film. The final point from the New 52 that I wish to address comes from the red-headed warrior princess herself. Mera has long been a love interest for Arthur Curry, but the New 52 AQUAMAN series really transformed her. No longer simply his queen, she is a warrior first-and-foremost. Born in the secret kingdom known as Xebel, Mera’s father trained her from a young age to kill Arthur Curry. Using her water-controlling powers, she could have succeeded. She saw the lie her father told her though. Arthur was no tyrant. He was a benevolent king, undeserving of death. As such, Mera betrayed her father and fled to Atlantis. Here, she fell in love with Arthur Curry, and when he fled his throne, she followed in his wake. We’ve already been introduced to Amber Heard’s Mera in JUSTICE LEAGUE, and from what we can gather, she is close to Arthur’s mother. As such, her New 52 origins likely no longer stick. Still, Dolph Lundgren is set to play Mera’s father and the king of Xebel. This leads to some interesting questions. Want more New 52 Aquaman? Check out The New 52 Aquaman #30! With Queen Atlanna still alive, could Mera’s story have simply shifted from son to mother? Could King Nereus have sent Mera after Atlanna, only for Mera to join with the Atlantean Queen? We do not know. However, we do see Mera side-by-side with Arthur in the trailer, fighting and adventuring as an equal. She has a warrior’s background, it would seem, and as such, this theory holds some weight. 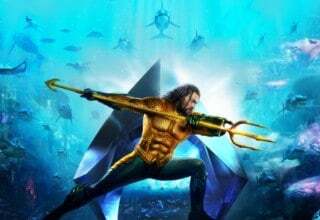 Outside of the trailer and the small amount of information leaked by Director James Wan, AQUAMAN is largely a mystery. Nevertheless, it is an exceedingly exciting mystery. Wan obviously has a deep devotion to the New 52 AQUAMAN stories. The trailer is filled with references to the source material, with just enough differences to make things interesting. The way that the film might seemingly combine disparate elements from three landmark AQUAMAN stories could possibly lead to confusion. However, two of those stories, namely “The Trench” and “The Others,” had far fewer ramifications than “Throne of Atlantis.” Focusing this film on the latter will give the story enough weight while still allowing Wan to explore Arthur’s history. No matter what path this film will eventually take, the hype train is definitely rolling out. It truly is better under the sea.